This lovely lakeside hideaway is set in what must be one of the most perfect locations for a lofty and luxurious treehouse retreat: a private island on a lake in Como, Italy. We were commissioned by the client to deliver a spacious structure capable of marrying the beautiful, verdant landscape with high quality stylish design. 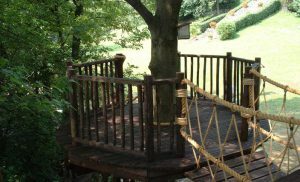 Through the use of sustainable building materials that complemented the natural surroundings, we were able to construct a tree house that sits harmoniously amongst the trees. The finished tree house is the ideal venue for barbecue parties, entertaining guests for cocktails or for just getting away from it all with some reading and relaxation. We take great pleasure in taking our client’s concepts and dreams and turning those into a reality. For this particular project, we understood that the private island location represented a sanctuary away from the hustle and bustle. 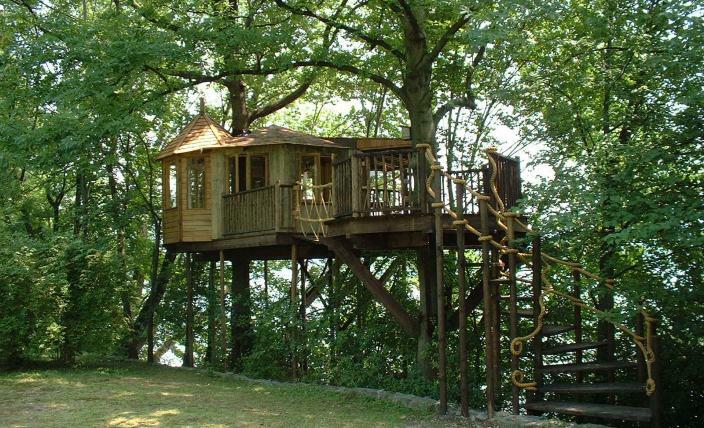 This made reinforcing its organic character paramount to design and build of the treehouse. The exterior is finished in a rustic softwood tongue and groove cladding while the roof is finished with lighter shades of cedar shingles. This combination of wood types allows the tree house to blend in with the surrounding trees as if to suggest that it has grown naturally within the woodland environment. In our efforts to preserve the natural scenery, no fixings have been driven into the living wood so that the trees can thrive and grow normally. 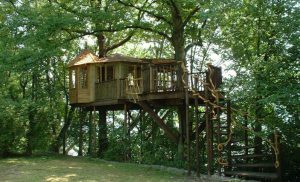 We implemented many windows around the treehouse that make the most of the sunlight and dappled shade. There’s also a sunbathing deck for the more hands-on sun worshippers. 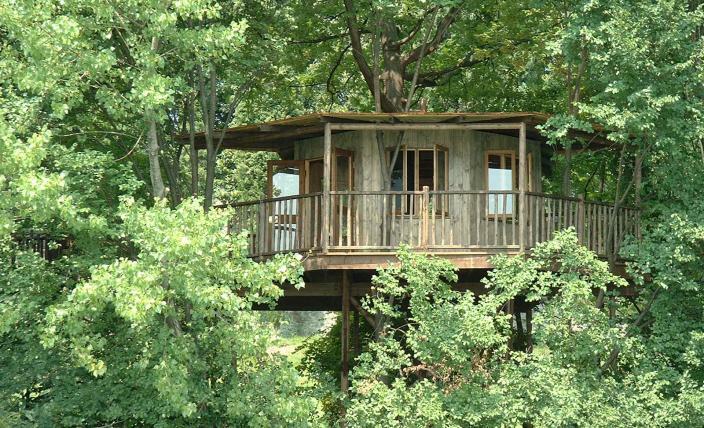 The entrance to the tree house is an adventurous journey in itself. The ascent begins with a twisty staircase with pleasantly thick twine handrails, echoing the long, winding branches in the backdrop. 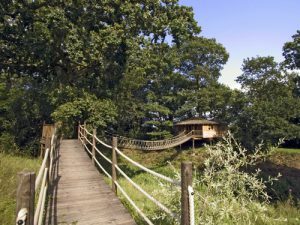 At the top of the staircase is a decked viewpoint built around one of the beautiful trees that have been integrated into the tree house. This leads, through a short bridge, to the extensive veranda built at the front of the treehouse. This upscale ‘Living the Highlife’ treehouse project is designed for luxurious family living with different areas that cater to the whole family. 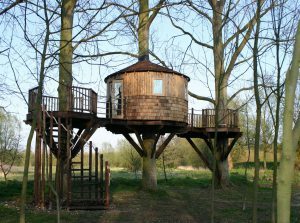 This luxury safari-style tree house is set in the beautiful Sussex countryside with far reaching views over the surrounding farmland. Open to guests throughout the year, the tree house is an ideal romantic retreat that replaces the hectic pace of urban life with seclusion, comfort and quite possibly, a return to your childhood dreams. The Woodland Den Tree House, built by Blue Forest, is supported on three trees lined up next to one another. 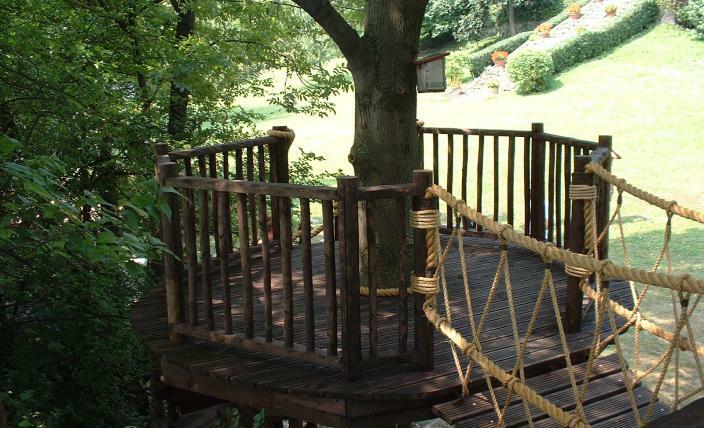 A sweeping spiral staircase with a light rope barrier leads the way towards this tree house and its two decks.